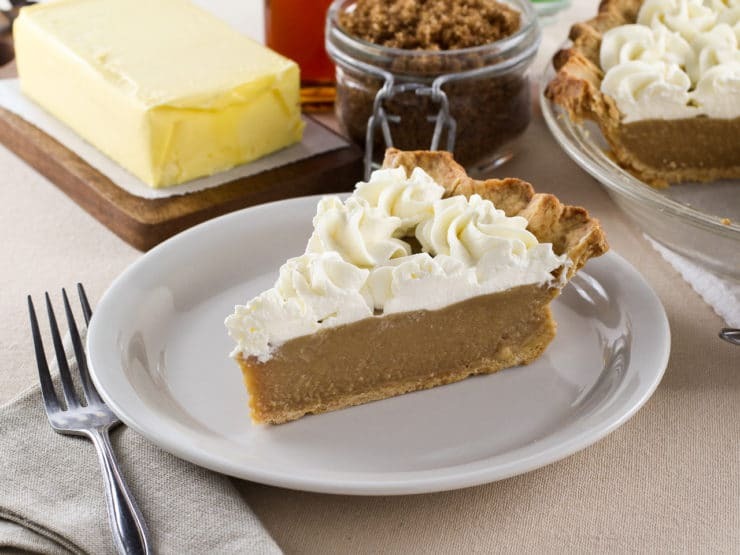 Butterscotch Pie – Lightly Sweetened Crust filled with Buttery, Caramelized Butterscotch Custard. Nostalgic, Family-Inspired Recipe. My father is a storyteller, and is happy to tell anyone who will listen about his adventures growing up. Of course, I have heard these stories many times, but I never get tired of them. He grew up with a single mother in 1940’s San Antonio, Texas, and they had enough money to live comfortably, but not for extras or treats. My father says as soon as he was able to ride a bike he would take off with his friends and roam the streets of town, getting into all kinds of high jinks. One tale that I always enjoy is of how he worked in a local bakery, sweeping the kitchen in exchange for treats. Clearly it was a different era when people mostly turned a blind eye to a young kid doing chores in exchange for food. The woman who ran the bakery took pity on him because he did not have the money to buy any of her baked goods. He was a cute kid, so I have little doubt he buttered her up and put on the charm. He was underage so she could not add him to the payroll. Instead she devised a way for him to earn some treats by helping tidy the kitchen in the afternoons. He swept and scrubbed as well as a young boy can, and in the end he would get to select a treat, or get to take home baked goods that didn’t pass muster. One of his favorite treats was a slice of creamy butterscotch pie. 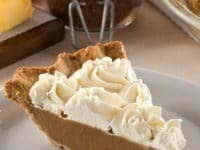 He said nothing has quite matched the glory of their butterscotch pie, thick and creamy with a distinct brown sugar caramel flavor. He would eat the slice in tiny bites to make each slice last as long as possible. That is something he still does, taking his time eating desserts so he can enjoy them for as long as possible. Now, it may be the influence of memory and time – you know the trick that makes things from your childhood seem better and more magnificent than they may have actually been – but no butterscotch pie he had as an adult could compare to the slices he earned as a child in the back of a San Antonio bakery. 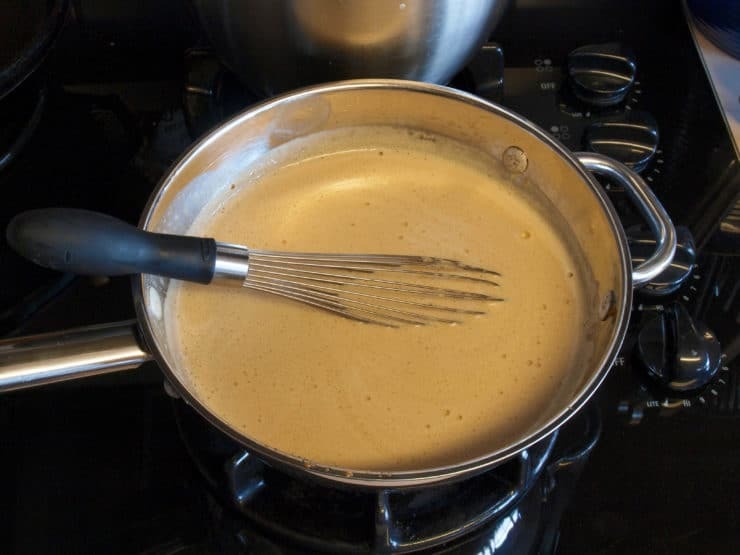 To get the best flavor you must cook the butter and brown sugar before making the custard. Brown the butter slightly, and letting the sugar just start to caramelize is the key. 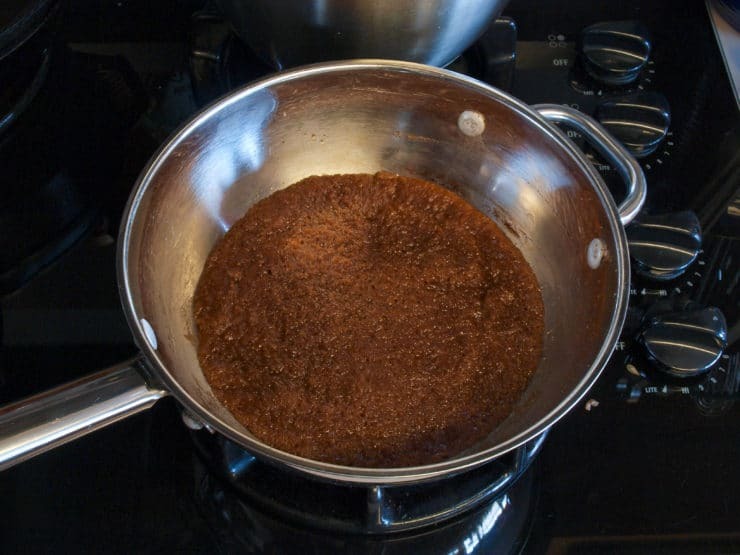 I have seen more than one recipe that says to simply use brown sugar in place of white sugar. That produces weak flavored custard. 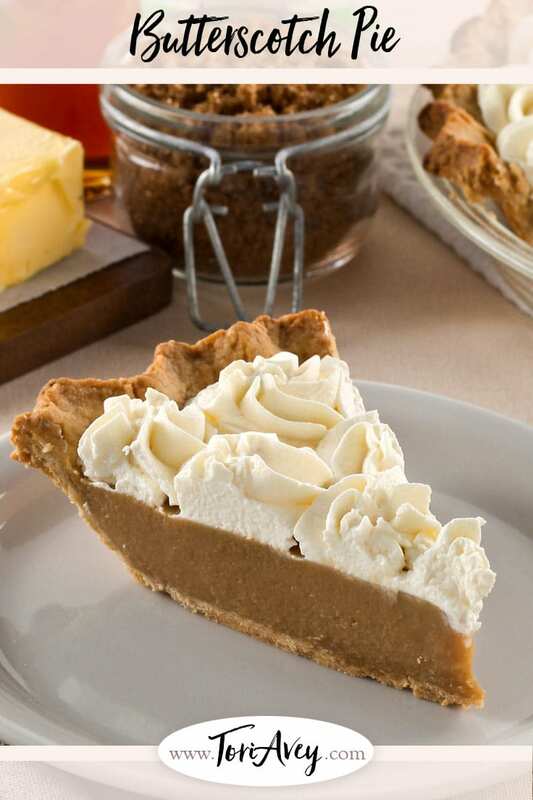 A blender or a food processor is your best friend for butterscotch pie. I tried to hand temper the eggs and cooked sugar mixture and half the time it would curdle. A blender or food processor helps prevent this, and also creates a silky, luxurious custard filling. Use high quality butter in your filling. I would hope you do anyway, but here it is vital as cheaper butter has a higher water content and less butter fat, and less butter fat means less browned butter flavor. 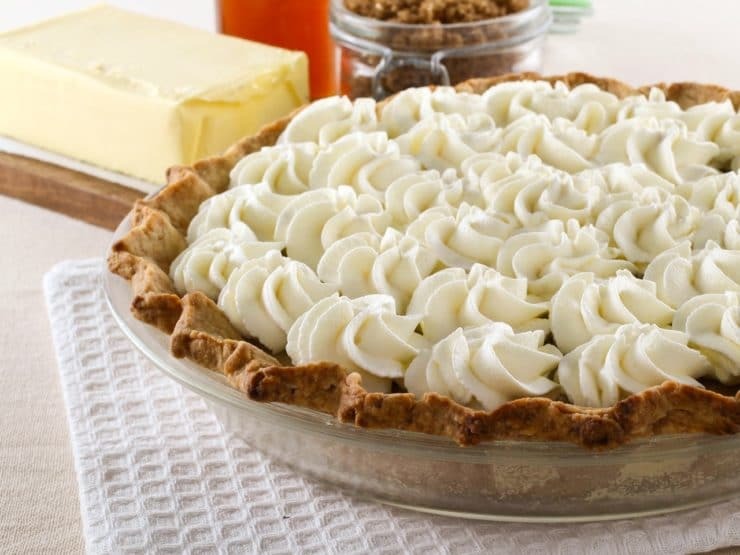 For this pie splurge a little. It’s worth it! I made this pie for my father as a surprise and he loved it! He devoured most of the pie himself over the course of a day. My hope is that this pie is as good as the pie from his memory. At least he does not need to sweep out my kitchen to earn a slice! 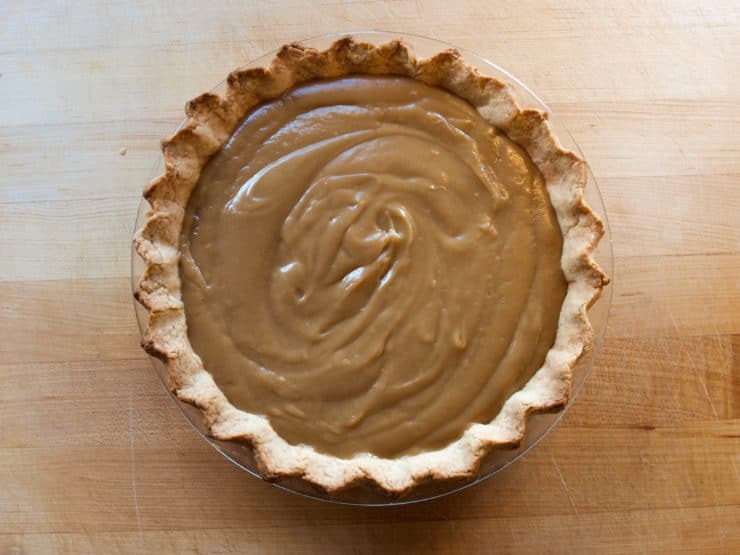 Lightly sweetened crust filled with buttery caramelized butterscotch custard. Nostalgic, family-inspired recipe from contributor Kelly Jaggers. Begin by preparing the crust. 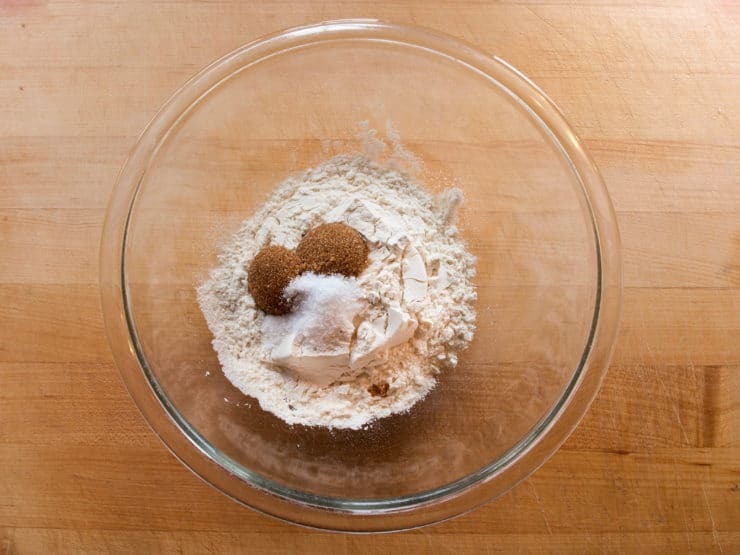 In a medium bowl combine the flour, brown sugar, and salt. 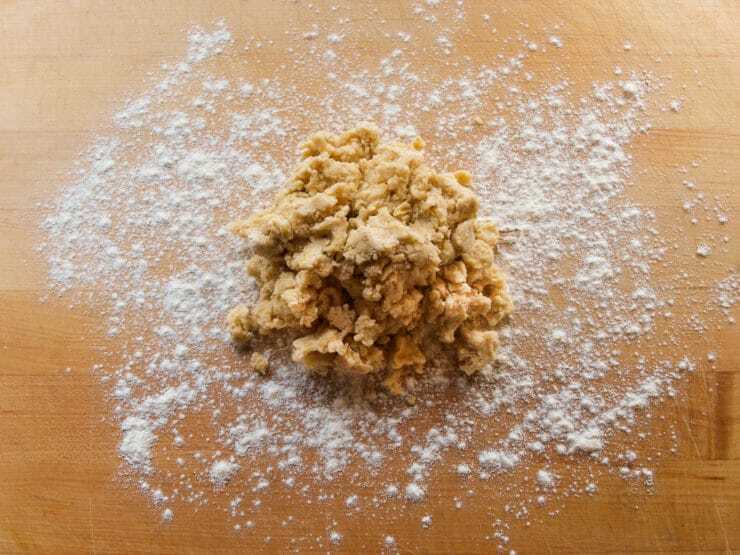 Mix until well combined then add the cubed butter and, with your fingers, rub the butter into the flour mixture until the flour resembles coarse sand with pea sized pieces of butter remaining. Add the ice water a tablespoon at a time until the mixture forms a shaggy ball. 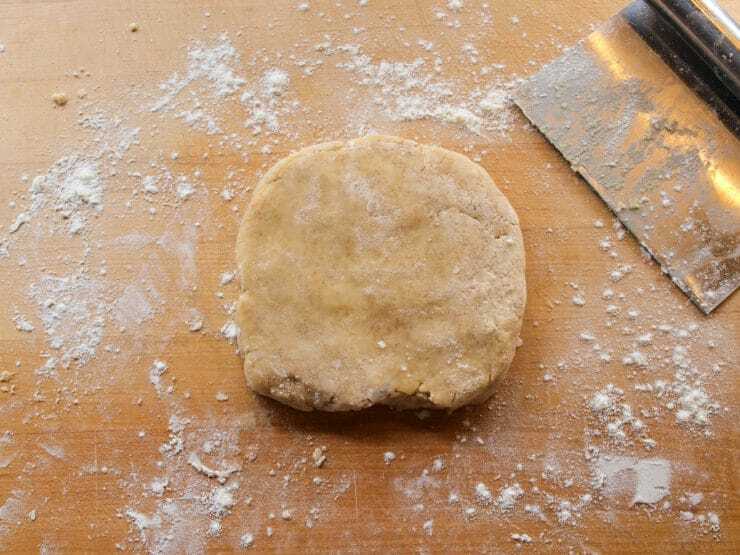 Turn the dough out onto a lightly floured surface and press the dough into a rough disk. Fold the disk in half and flatten it out into a disk. Repeat this process three more times, or until the dough is smooth, then wrap the dough in plastic wrap and chill for at least one hour or up to three days. Heat the oven to 350°F. 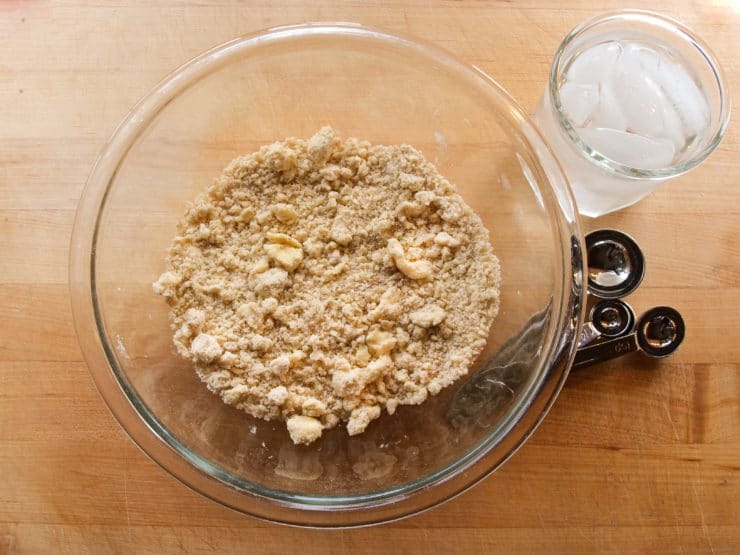 Remove the dough from the refrigerator and let it sit at room temperature for 10 minutes. Roll the dough out on a lightly floured work surface to a 12-inch circle that is about 1/8-inch thick. Turn the dough often, and dust the surface with additional flour as needed to prevent sticking. 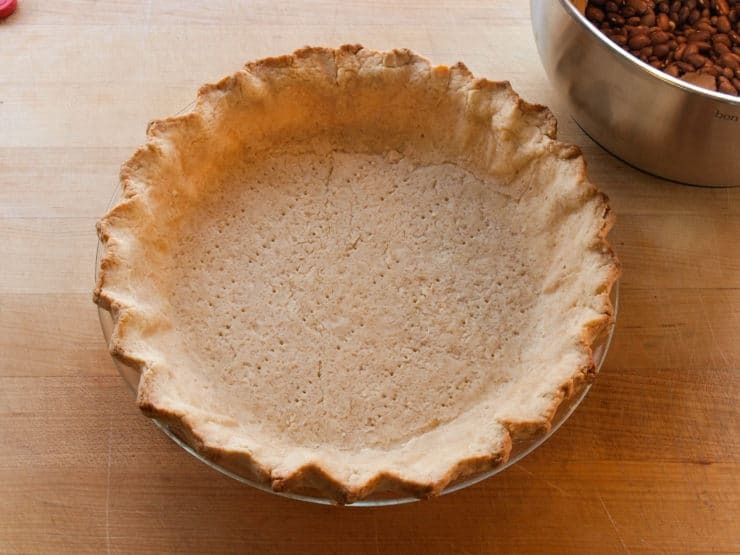 Carefully fold the crust in half and place it into a 9-inch pie pan. Unfold and press the crust into the pan. Do not pull or stretch the dough. Trim the crust so there is a ½-inch overhang around the edge of the pan. 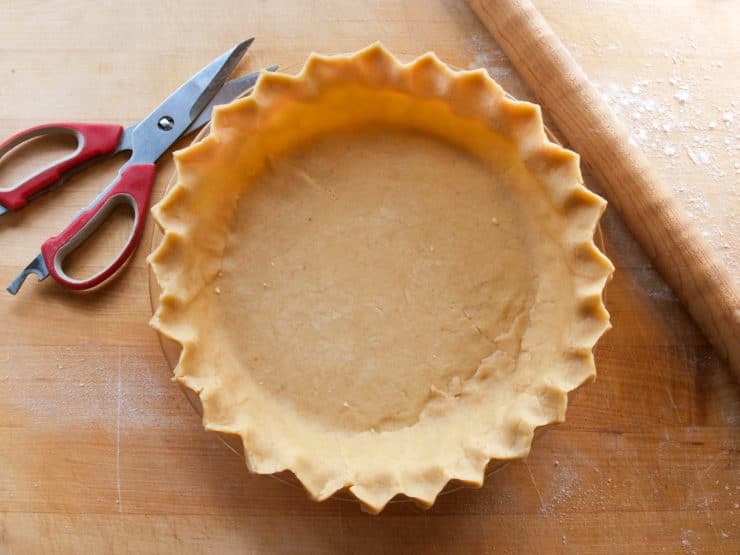 Fold the excess crust under and crimp the dough with a fork or your fingers. Gently prick the bottom of the crust a few times with a fork to help prevent large air bubbles from forming under the crust. 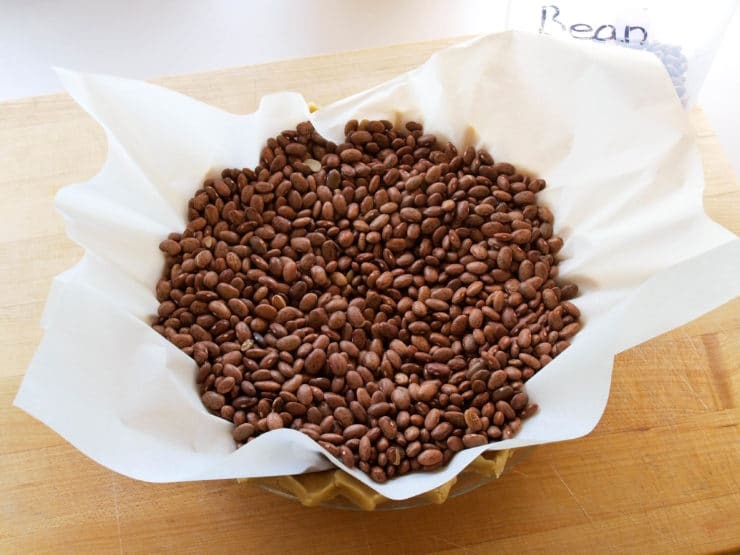 Line the crust with parchment paper or aluminum foil and fill the crust with dry beans or pie weights. Bake the crust for 15 minutes, then carefully remove the lining and pie weights and return to the oven for 15 to 20 minutes more, or until the crust is golden brown all over. Allow the crust to cool completely to room temperature. Next, prepare the filling. In a medium saucepan add the brown sugar and butter. Heat the mixture over medium heat until the mixture comes to a boil. 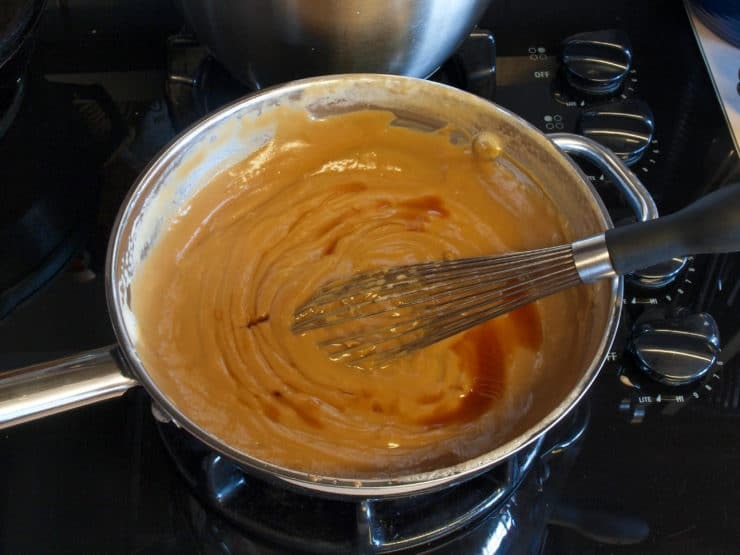 Cook for 30 seconds, or until the mixture starts to smell like caramel, then remove the mixture from the heat. In the work bowl of a food processor or blender add the half and half, cornstarch, and egg yolks. Blend for 30 seconds to combine then gradually, with the blender or food processor still running, begin adding the hot sugar mixture a tablespoon at a time until half the mixture is added. Stop the blender and add the remaining mixture and blend for 30 seconds or until the mixture is smooth. Return the mixture to the sauce pan and cook over medium heat, whisking constantly, until the mixture comes to a boil and thickens, about 8-10 minutes. Turn off the heat and whisk in the vanilla. Pour the mixture into the prepared crust and place a layer of plastic wrap directly on the filling. Cool for 30 minutes at room temperature, then refrigerate for at least 4 hours, or up to 2 days. When you are ready to serve prepare the whipped cream topping. 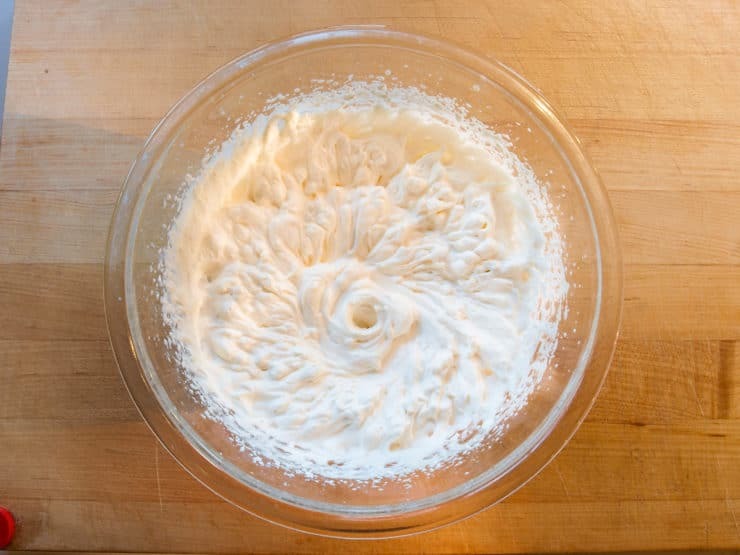 In a large bowl with a hand mixer, or in the work bowl of a stand mixer fitted with the whip attachment, add the heavy cream, powdered sugar, and vanilla. Beat on low speed for 30 seconds to combine the powdered sugar, then increase the speed to medium-high and whip until the cream forms soft peaks, about 2-3 minutes. Pipe or spread the cream on the pie as desired. Chill for 30 minutes before serving. But then you show the photo illustration a glass jar of dark brown sugar behind the pie as well as the step by step photos. Everything I have read tells me only use white sugar and my caramel is balanced. 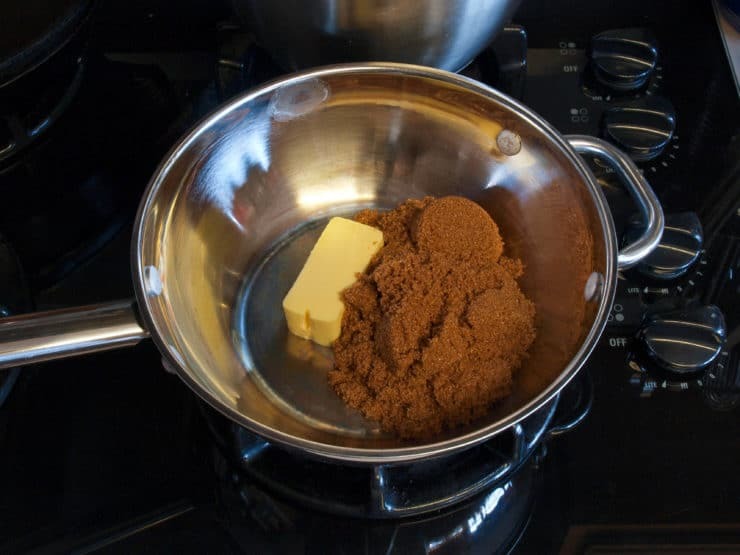 This is Kelly’s recipe, but I’ll chime in here – she mentions that “To get the best flavor you must cook the butter and brown sugar before making the custard.” She is not saying not to use brown sugar, but rather to cook it together with the butter before making the custard. I made this recipe and it turned out perfectly, other than the flavor was subtle, not as strong a butterscotch flavor like I had hoped. Any suggestions? In reading Cook’s Illustrated they comment on how whisking or aggressively stirring cornstarch causes it to break down and not be as thickening as we would want it. I’ve had that experience making Chocolate Pudding and had no clue what I had done wrong until reading this in Cook’s. Do you have that problem with this pie at all?? 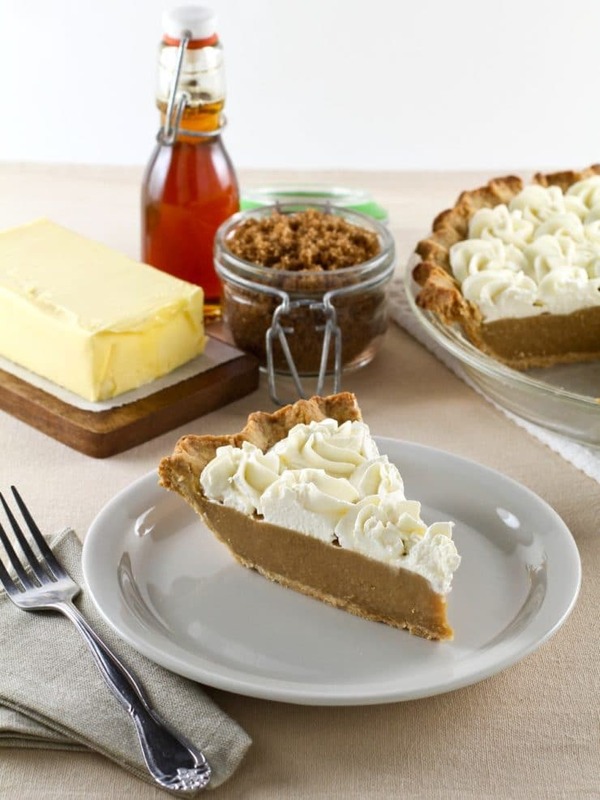 I plan on making this for a friend next week – she is crazy about “Butterscotch Pie.” Many years ago I had a similar recipe where they cooked the Brown Sugar and Butter ahead as you do and you’re right – it makes all the difference! OMG! Made the butter scotch pie! Never had it before. And it is to die for! Thank u!! I did the same for my dad but I think I used a recipe from either a 1940’s version of joy of cooking or the other ancient cookbook my great aunt had and they both carmelized white sugar. Dad said it was perfect so you might want to try that. Love the custard filling! Mine didn’t taste much like butterscotch though, maybe because I used dark brown sugar? Hi, Tori’s assistant Ashley here! We’re so pleased that you liked the recipe. I’m not quite sure why your custard didn’t taste much like butterscotch, since this recipe was created by our contributor Kelly Jaggers. I know Kelly does emphasize the importance of cooking the sugar and butter in the filling before adding the other ingredients. Maybe try it with the light brown sugar next time and please let us know how it turns out! Add hot ingredients slowly, especially into a blender or processor. If it’s too hot the eggs will not have enough time to adjust and will not temper properly and could curdle. Easy does it! The hot mixture will curdle the eggs if you don’t add a little at a time, tempering or bring the egg mixture up to a temperature that will easily and smoothly combine. I had found a recipe for a butterscotch pie made by a famous celebrity chef, but reading the reviews, it didn’t sound too promising. I googled for another recipe when I found this one. OMG, I am so glad I did. I loved and appreciated having the photos along the way as well as the ease in making it. Thank you so much and I look forward to sharing this pie with my mom tonight. Like your dad, she has memories of a butterscotch pie and she has never been able to have one as good since. I am hoping that this pie will bring back memories for her as well as it did for your dad. Thank you!! Great pie. Thank you for sharing. Hello from Australia, I made this pie on the weekend. It turned out exactly as the picture and was fantastic. Will definitely make again. Thanks for a great website. I made this pie today and I am tempted to hide it and keep it all to myself. A rather labor-intensive dessert, but so worth it! Loved your story about your Dad growing up and helping in the bakery in exchange for treats. Reminded me of listening to my Dad and his stories about growing up in the 1930’s and early 40’s. Love butterscotchie as my Mom did. Thank you. I loved this story. It’s as sweet as the pie!! Years ago I had a delicious Butterscotch pie at a friend’s restaurant that had a hint of heat to it. I asked about the heat factor, and he said they out a little bit of cayenne pepper in the filling. It was the best! Isn’t every day National Pie Day?